The Estonian Industrial Rock group EVESTUS was formed in 2008 when founder OT Evestus gathered a band of musicians to perform at MTV Baltics Birthday Party. The band consisted of two guitars, four cellos, keyboards and live percussions. Since all the music is written and produced by OT, then the band's line-up has remained dynamic with drummer and percussionist Tanya as the only steady member since 2008. With the first LP "This Is Dramacore" (2010) Evestus gained the international acknowledgement of underground goth and industrial scenes as an act to watch out for and after 2012 EP "No God", accompanied by 4 official music videos, Evestus was playing clubs and festivals in Baltics and Scandinavia for two years. At the end of 2014, Evestus released "No God : Dissecting Faith" Rare/Remix album and entered the studio to write and record a follow-up LP to "This Is Dramacore". In October 2015 Evestus released a new single and video "Watch You Leave" and the band lost half of its members. In 2016 Evestus regrouped, went on tour with MINISTRY and started work on a new album with producer Ade Fenton (Gary Numan). 2018 Evestus took part in the Estonian Eurovision pre-contest with “Welcome to my World” and even though they didn’t go to represent Estonia in Eurovision, Ott Evestus was chosen to be the spokesperson for Estonia, reading Estonian votes during the Eurovision Song Contest. At the end of the year Evestus released a music video for “Everything in Here” and signed to a UK label Syndicol Music. In March 1st 2019 Evestus released “Post 18 Depression” EP, featuring a Tears For Fears cover “Mad World”. 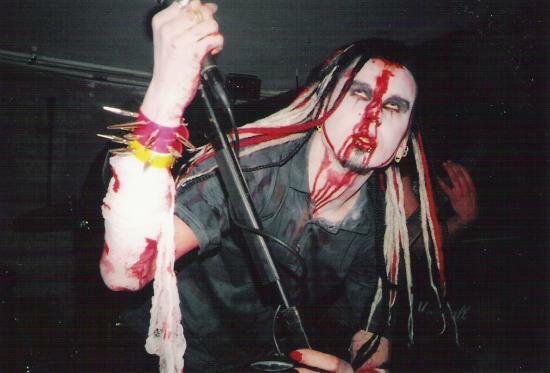 OT Evestus first became locally known as an insane frontman of a nu-metal band Solwaig. The scene people had mixed feelings towards him because he performed every show with a new outfit and make-up, but always kept to himself. Never hung around before or after the band performed. Everyone knew the rest of the band, but noone knew him. So started different stories about "Evestus" inspired by the lack of information available on this guy... and these stories and rumors started inspiring him into pushing the boundaries of what "Evestus" could be..
His first album was a collection of songs that were basically just piles of loops and samples from movies and cartoons such as “Fight Club”, “Airheads”, “The Nightmare Before Christmas”, “The Maxx”, “Invader Zim” and others. The year was 2004 and the album was titled “Destiny in Life” to symbolize his calling. His destiny. As if he needed more proof, the album, which only had 200 copies made, somehow found its way to Canadas D-trash records who decided to release it under their label to a wider audience. Basically, Evestus got signed. It came as a huge surprise to everyone, for no one took this album for more than a cute way of preserving ones collection of digital rantings. But Evestus knew this was it. That he was given a clear sign of his path. The second album was a very solid work inspired by a box office hit PC game “Fallout 2″. “Wastelands“, a diary of a vault dweller, was a concept album with a very distinct sound and style. A “post-apocalypse pop music” as some referred to it, featured hints of raw industrial soundscapes mixed with classical instruments and even a bit of dixieland jazz. D-trash records went all out on promoting this album and it received very good reviews all over the world. Evestus became an established name in the industrial underground and started to receive a lot of requests for live shows. The problem was, he had never thought about performing his music live. But at this day of age, if you want to make it as an artist, this is something you can’t ignore. This was a tough break for Evestus. Around that time, Solwaig had it’s last shows and broke up. After a brief period as a percussionist in Forgotten Sunrise, Evestus realized that he had to take his solo project to the next level, because he could never settle with being a cog in someone else’s machine. 2006 – It’s getting darker..
Evestus reformed his little “studio” that until now had been nothing more than an old pc with a soundblaster pro sound card and desktop speakers, and started writing new songs with a live band in mind. You see, Evestus was very theatrical when it came to Solwaig live shows and he had always believed that when you go see a live show, you go to see a show foremost. He had little respect towards bands who play on a stage in the same manner they play in their bedrooms. That is why he could not bear the idea of performing his previous material live through a laptop as so many similar artists did. It was simply not enough of a show for him. While 2006 and 2007 were spent researching music production techniques and live solutions, Evestus actually worked at several studios during that time in order to gain insight and experience on audio production, fooling the managers into thinking that he had any knowledge on the field, while all he was after was a chance to spend time in a real studio. Some of the vocals on “This is Dramacore” were recorded in these studios as well of some of the “Sacrifice” video footage. Evestus spent many nights alone in these studios, drinking and recording. When the owners became aware, he was fired. But he had gotten what he was after. 2008 was when things started really happening. The “Sacrifice” single [released through Estonian hip-hop label Legendaarne Records ] along with a video by Grete “Stitch” Laus, made it to the MTV Baltic’s Top 20. The single was followed by a lot of local press and at the end of the year another single was released, “You’re Not Good Enough To Be My Enemy” that landed #4 at MTV Baltics Top 20 leading to a lot of live shows starting with a gig at MTV Baltic’s birthday party, supporting Kerli. Evestus had one week to put together a band for the opportunity. The result was Georg “DzDz” Gurjev (Horricane) on keyboards, Ricardo Guerilha on 1st guitar, Jan Talts (former Solwaig) on 2nd guitar, Tanya on percussions and from Estonian National Symphonic Orchestra – 4 cellists (also known as C-Jam Cello Quartet) on 4 cellos. 2009 was spent finalizing “This is Dramacore“. Aside from a slight distraction in the form of NOKIA Music Gala, which once again showed Evestus live at it’s greatest. But with a solid live band to back him up, Evestus got a chance to re-record and replace virtual instruments with real ones and truly bring his musical concept to life. A track called “Conveniently Confused” was released on a UK-s Terrorizer Magazine covermount cd in their 2009 October issue. Tanya on a full drumset and by Hard Rock Laager festival in July, Evestus was ready to hit the stage with 50 minutes of pure Dramacore! Later that year, Evestus joined forces with Finnish industrial-rockers Apples of Idun and Estonian deathbeat act Forgotten Sunrise to visit Riga and Vilnius and spread the northern industrial wave in the Baltics! Even though “This is Dramacore” was very well received by the critics everywhere, the success was not enough to keep a 9-piece band together in Estonia. Even as a 5 piece, touring the Baltic states and Finland used up every bit of financial resource the band had, between upgrading the bands technical set and the European economic collapse resulting in empty venues all contributed to a stress within the band that after a series of costly shows, Evestus decided to take a break and evaluate the situation. Ofcourse, giving up the music was never an option. Most of 2011 went into writing material for a follow up and strategic planning – with the music industry going through nearly revolutionary changes every month, this could be the best time to be an artist. Or the worst. In October 15, 2012, Evestus released a music video “Sleep Forever” with an announcement that a new EP will be out before the end of the year! After almost a year-long hiatus from the band, this felt like a new beginning for Evestus and his fans alike! The new video flew right to the top (#1) of Estonian weekly music video chart “Eesti Top 7″ at Estonian national television on November 6th and stayed in the chart for four weeks. “Sleep Forever” was followed by another video a month later – “Voices”, that was released in conjunction with a free digital single including the title track and two remixes (By Chaos Royale from Tokyo and Apples of Idun from Finland). This single made way for the EP released on December 21st 2012 titled “No God” and packing 5 brand new songs, including the two aforementioned video tracks. The “No God” EP was released as a digital download and limited edition CD digipak – limited to 300 numbered copies. A sign that this release was more of a treat for close fans and a testament to the public that Evestus is alive and kicking while the band keeps on working on their next full-lenght worthy of a spot next to their previous opus “This Is Dramacore”. "Sleep Forever" music video landed at #9 on the Estonias Top 50 Music Videos of 2012 chart! 2013 begun with the “Voices” video entering the Estonian Music Video Chart “Eesti Top 7″, following its 2012 successor “Sleep Forever” in nailing the #1 position on its first week in the chart! In April Evestus played live at Tallinn Music Week, as a statement that the band is fully active and once again a force to be reckoned with! The same month ORKUS magazine featured Evestus as an act to watch out for! TMW gig immediately drove in live offers from all the Estonian promoters! on May 5th Evestus released their first official online Merch store making it well known that Evestus Merch is not only wearable but highly collectable! In August, HK decided to leave the live line-up for personal reasons. In September John joined the band as a guitarist and Jan switched from guitar to Bass. The next month Evestus struck a deal with Ian Jansons from Latvia to become the bands manager. In December 18th Evestus released a music video for “The Fall” that was featured by torrent portal The Pirate Bay. In January, "Voices" music video landed at #4 on the Estonias Top 50 Music Videos of 2013 chart! The new manager Ian Jansons started organizing gigs for Evestus starting with two Latvian dates with Freakangel in February. In April "The Fall" music video entered "Eesti Top 7" M/V chart where it stayed on #1 for five weeks. In May Evestus filmed the last bits for "No God", their sixth official music video and the summer was spent playing festivals (Klang, HRL, Letkurock, Findustry...). "No God" music video was released with the "No God : Dissecting Faith" Rare/Remix album (digital only) on September 1st - including remixes by Freakangel, Chaos Royale and i! (Armalyte Industries) . 2015 - OTT Evestus started the year by disbanding the live band once again and spent most of 2015 in solitude, writing, re-writing and recording demos for the next full length Evestus album. Working title "Monster I've Become". A somewhat detached song and video "Watch You Leave" was released on October 26th. Evestus took the stage at Tallinn Music Week 2016 with Tanya back on drums and a new member Simo on guitar to show the live band in it's best shape yet! In June the band toured Scandinavia with Finnish industrial rockers The Physicists. Later that month Ott Evestus went to UK to work on his new material with producer Ade Fenton. In August, Evestus was offered to support the industrial rock legend MINISTRY in Moscow and St. Petersburg, kicking off their ´From Beer to eterna-tour´. Two months later Evestus was supporting Youth Code in London and Bristol. HK joined Evestus on keyboards for both tours. 2016 was finished with a furious appearance at Body Machine Body festival in Tallinn in November after which Ott turned his focus on finishing new material for 2017 release. 2017 in MAY Evestus toured the Baltics, Czech and Slovakia with italian glam-rockers Psycholies, in August Tanya joined the other known Estonian industrial band Freakangel as a full-time member and left Evestus. She was soon replaced by Siim Jõgioja when Evestus was elected to take part in the Estonian Eurovision pre-contest “Eesti Laul”. In September Evestus released a digital single “Enemy Reloaded” with “I am Hate” as a B-side. Enemy Reloaded and Dramacore also received lyric videos as a collab project of Grete “Stitch” Laus and Ben Garcia (Ministry).